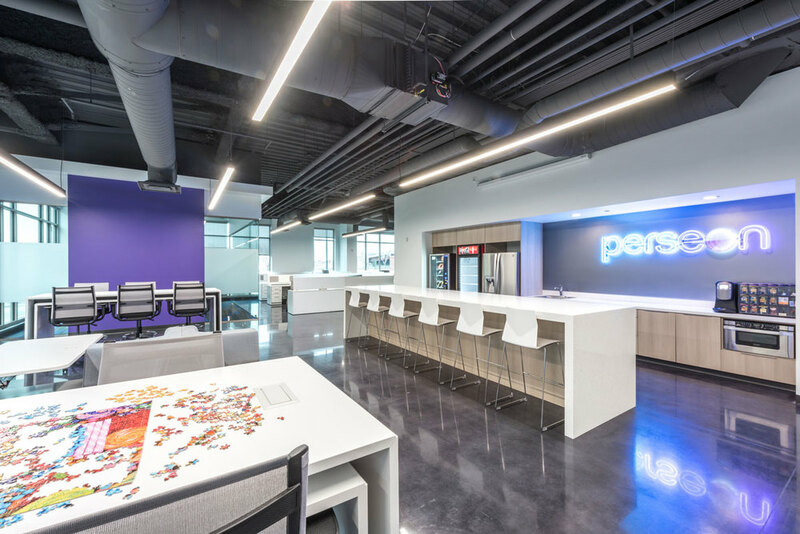 Dedicated to developing and manufacturing innovative medical systems to treat cancer, Perseon was looking for a space that was not only beautiful and functional but clearly spoke their brand to clients and investors. Creating a clean, modern aesthetic leant itself perfectly to their industry. As a company engaging with a lot of investors it was our highest priority to ensure perceptions were managed. We took great care to design a space that was thoroughly thought out and detailed but that kept cost and extravagance to a minimum. This direction also lent itself to the clean, almost lab type feel we created for them. It was our goal for people to understand what their company was about without even being told. Their technology dealt with precision-focused microwave energy, we of course saw that as an opportunity to play with light reflection. Throughout the space we incorporated elements of high-polish, high-gloss and stark white to reflect the intentional use of simple yet impactful light elements.